Oleaceae - olive family Dicot. 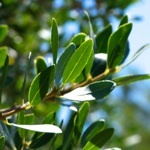 A member of the olive family, Phillyrea latifolia is a sclerophyllous plant characteristic of the Mediterranean biotope. It grows in Macchia, often entangled with neighbouring plants., and as a plant in the understory of the forest. The thick dark green leaves have a waxy coating which helps to protect against the hot, dry, high-light conditions. The inconspicuous creamy flowers are followed by berries which resemble olives in appearance. In its native habitat the plant tends to grow as a straggly bush but it was introduced into gardens of Europe as an an evergreen plant, where it grows as an attractive, well formed architectural tree.